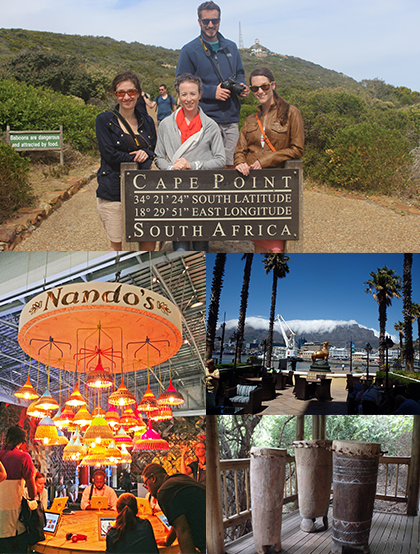 In March, Walt, Megan, Christy, Amy & Joe attended the Design Indaba in Cape Town, South Africa. The speakers at the Indaba practice across a wide range of creative endeavors, such as fine arts, film, architecture, marketing, sculpture, music, craft arts, fashion and more. Robby Brozin of Nando’s spoke about Nando’s business model and about the initiative to source furniture, lighting and décor from South African artisans in Nando’s locations worldwide. This will enable small South African artisans to grow their businesses on a global scale. Aria Group will play an integral role in this initiative. The Chicago Nando’s locations designed by Aria Group will be the first outside of South Africa to extensively source furnishings from South African artisans. Nando’s became clients of Aria Group in 2009 when we were hired to expand the concept in the U.S. This small but growing market will allow South African artisans to scale up their operations to meet worldwide demand at a sustainable pace, while maintaining the hand-made, artisanal quality that makes South African products so desirable. The Design Indaba was the ideal setting for our designers to network with South African artisans. In addition to the networking opportunities and creative inspiration that occurred at the Design Indaba, the Nando’s team had the opportunity to relax, enjoy and explore the area around Cape Town and other parts of South Africa. What better way to get a feel for the land and culture that the Nando’s brand originally grew out of?